The only true constant in Moonlight is its look. It is an odd sort of luminescence, bringing out the vibrancy of the subject while turning everything not in the immediate foreground into a impressionistic haze of blurred colors. The effect is definitely one of immediacy, but crucially, it is immediacy that belongs to all time periods: apart from some signposts in the form of cars, cell phones, and music, the setting of the film, Miami, doesn’t seem to change all that much. The background of run-down homes, barred windows, and an moonlit beach stay the same, while the people and their changes are highlighted in stunning detail. The movie’s visual style mirrors Barry Jenkins’ approach towards his main character, Chiron. The story of Chiron’s growth during three decades in Miami, Moonlight functions less like a biography and more like a series of snapshots. Each section, denoted by the name Chiron goes by in each section (Little, Chiron, and Black, respectively), is set over a few consecutive days, and the events are at once the most consequential and yet seem like transitions to different stages of Chiron’s life. They are formative moments, in a sense, and they come together over the course of the film to gather a quiet, cumulative force that dazes the viewer, making them feel as lost yet as at home as Chiron does. For the most part, Moonlight follows the two influences that come to define Chiron: his parent figures, particularly his junkie mother Paula (a by turns manipulative and broken Naomie Harris) and drug dealer Juan (Mahershala Ali, overwhelmingly compassionate), and his burgeoning identity as a gay black man. More than often, these are inextricably entwined. In the first scene, young Chiron, called Little in this segment (an almost mute yet expressive Alex Hibbert), runs past Juan while being chased by bullies. After this initial coincidence, the film’s moments arise out of unexpected developments in relationships already well established, as Chiron grows and learns more about the people around him. But through other people, he learns about himself too. Though the moments that ultimately have the most impact on Chiron’s existence come invariably at the end of each chapter, the ones that affect him more on an emotional level come more towards the middle. For Little, there are many but none more inexplicably serene as when Juan teaches him to swim, holding him in an almost baptismal pose in the ocean. For Chiron as a teenager (a belligerent and remarkably self-contained Ashton Sanders) it is an encounter on the beach with Kevin, his lifelong friend, the sexual nature of which plays out entirely through hands moving through the sand. For Black (Trevante Rhodes, hulking but astonishingly sensitive), it is an extended conversation at the diner where Kevin (André Holland, immensely caring) now cooks, the two not having seen each other since the previous chapter. These moments are never announced, never spotlighted. But it is precisely because of this that they have such power; in contrast to other scenes (mostly involving Paula and a gang of bullies) that seem at times a bit overdetermined, harrowing as they are in the moment, these moments of serenity are as unadorned as they would be in life. And it is this sense of life that makes Moonlight so dazzling. Though it has as much to say about masculinity as it does gay identity—Black, a drug dealer in Atlanta (before he goes back to visit Kevin in Miami) is almost a mirror image of his father figure Juan, complete with a grill—it is at heart the story of a boy who learns to become a man. But Jenkins never lets it fall into clichés, with his sketch-like approach, his luminous depiction of Miami, and most importantly of all, his grounding in Chiron. 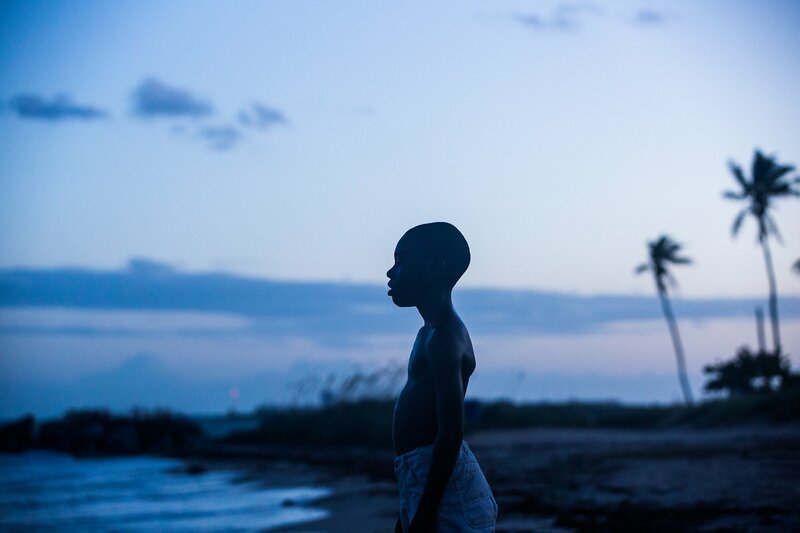 Despite, or perhaps because of, his representation of Chiron in three actors and three time periods, Moonlight is truly emotional and universal while remaining profoundly coded in the black experience. The final two shots both provide a conclusion and a continuation; at heart, we are all children in the waves of time.